You want an easy-to-use interface with all your data sources and good looking reports with which to impress your clients thanks to your results? DashThis is the perfect Cyfe alternative for you: it’s an all-in-one analytics tool, perfect to easily gather all your marketing and business data into one, beautiful report. Why is DashThis the Cyfe alternative you need? DashThis is a marketing reporting tool created exclusively for marketers and agencies; our reports are tailored specifically to your needs. You get an easy-to-use interface to gather all your key metrics, data sources, and social analytics into a beautiful interactive dashboard your clients will love. Use our flawless drag-and-drop interface to easily customize your report's layout. No IT team or coding required; creating reports is as easy as 1-2-3 with DashThis. You even get preset widgets and report templates so you don’t have to create everything from scratch! DashThis is not a complicated business intelligence software: it's a dashboard software designed to create beautiful and easy-to-understand reports for your clients. It's the perfect Cyfe alternative for good-looking, easy-to-use reports. As hundreds of user reviews state, DashThis is renowned for its epic customer support! No matter the plan you choose, you get your very own account manager. Share your interactive dashboards with as many colleagues as you need! Let your clients see their business analytics exactly as they want: as a PDF, with a shared URL, or even through an automated email dispatch! Ready to try an epic Cyfe alternative? DashThis has all the reporting features you’ve been looking for! No IT needed! Our tool was created to help you save time and simplify your life! Use our user-friendly drag-and-drop feature and create a report exactly how you want it, or try our preset widgets and report templates to make it that much easier. All DashThis plans come with unlimited users! All your colleagues will have real-time, easy access to your data visualization software. You can combine all your data sources, accounts, or pages, and it’s as easy as can be. All our 30+ marketing integrations can be added with just a few clicks: no programming, no third party systems, no problem. Replace your report’s URL by one that’s branded to your company: reports.yourcompany.com sounds great! Gather Google Analytics, Mailchimp, LinkedIn, Facebook, Twitter, search engine data, social media data, email marketing data... all your marketing KPIs! Whether you need a business dashboard, a web analytics report, or any other types of marketing reports, DashThis gives you the perfect easy-to-use data visualization tool for your marketing needs thanks to our 30+ built-in integrations. 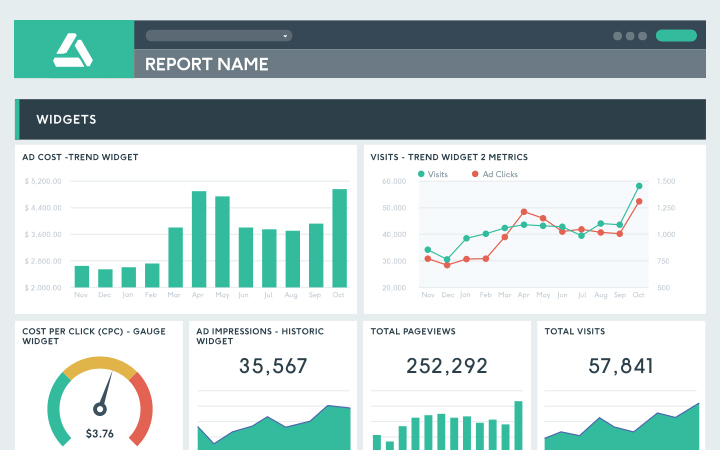 DashThis is the perfect reporting tool for agencies’ marketing reports and big data analyses. You can trust us to help you with your business analytics. Our dashboard software is easy to use, good-looking, and on top of that, we have an incredible support team to help you. No matter the plan, our analytics platform delivers the best reports out there! But don't just take our word for it! Take a look at some user reviews!